“Bouquet-Drive” at the bottom of the glass enhances the development of the aroma. The slightly conical glass design concentrates the bouquet regardless of white, red or sweet wines. All of them provide a maximum of enjoyment. The glass remains resistant in spite of its fineness. Full wine enjoyment is guaranteed because of the attractive pricing of the GABRIEL-GLAS©. 1500 Gabriel-Glasses are in use! 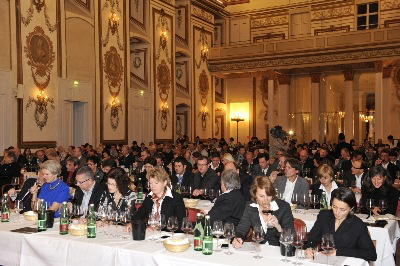 A wine tasting including 220 people and dinner for 130 guests at the Schloss Esterhazy [Esterhazy Castle] in Eisenstadt (Austria).